BitTorrent is two things, depending on how many pencils you have in your pocket protector. 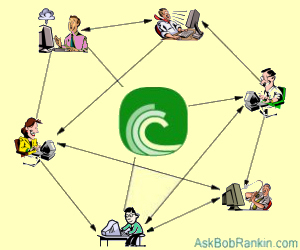 In technical terms, BitTorrent is a peer-to-peer (P2P) platform designed to deliver large files over the web. The BitTorrent file distribution protocol was created by programmer Bram Cohen to distribute large amounts of data by relying on an ad-hoc network of individual users (peers) instead of expensive servers and bandwidth resources. In a nutshell, BitTorrent speeds up the download time by getting smaller chunks of large files from many different sources. A more popular file can be downloaded faster, because many people will be downloading it at the same time, while also uploading the data to other users. BitTorrent is also a software program that provides Internet users with downloadable digital content such as films, music, games, ebooks, podcasts and software. To use BitTorrent, one needs to install a BitTorrent client, a free software program that implements the BitTorrent protocol. The client has the capacity to prepare, request and transmit any type of computer file over a network. Based on your operating system and computer horsepower, many BitTorrent clients are available for download. Some clients are laden with obnoxious adware, but here are two that work well and are malware-free. µTorrent is the most widely used BitTorrent client outside of China, where a client called Xunlei reigns supreme. Owned by Bittorrent, Inc., the company that developed the BitTorrent protocol, µTorrent runs on Windows or Apple platforms and is ad-supported. BitComet is a multi-protocol downloading client for Windows. It does BitTorrent, FTP, and HTTP downloads, incorporating various features that make it easier to download lots of files from many different sources simultaneously. While sharing the large files over the internet, the usual problems faced are bandwidth constraints, upload limits and other problems peculiar to the internet. To tackle this problem, BitTorrent breaks a large file into number of pieces, or torrents. To recognize each piece, the software tags it with a checksum (sort of a digital fingerprint) and records it in the torrent file. When the file is being downloaded, the checksums in the original files are compared with the checksums in the received file to make sure that the file is complete and error-free. A typical BitTorrent file will contain an 'Announce' section, which specifies the file names and length of each individual piece. The person wishing to make a file available can place a link to the file on a website. Users who want to download a specific file can browse or search the web, then click the download link, which opens the BitTorrent client to begin the download. While downloading a file, the BitTorrent program connects not only to the link, but also to other peers who have the same file. This way, sharing of network resource is maximized and the download becomes faster and more reliable. One criticism of BitTorrent is that the benefits of the P2P sharing can break down as more and more people have the beginning of a file, and no one has the end. Download speeds can slow to a crawl in such a situation. And for files that are not often downloaded, it can actually take much longer than a direct download because BitTorrent is optimized for downloading in a many-to-one environment. Is Bittorrent Safe and Legal? There are also reports from Internet service providers that BitTorrent and other P2P traffic is consuming 60 percent or more of all Internet bandwidth. Granted BitTorrent is just a protocol, and as such is neither good nor evil. But it stands to reason that most BitTorrent traffic is illegal downloading of copyrighted materials. Couple that with the high costs of bandwidth, and you can understand why some ISPs are banning or throttling P2P usage. You should also be aware that illegal downloading of copyrighted music, movies or software can get you into financial or legal trouble. Copyright owners (for example, the Recording Industry of America, and the Motion Picture Association of America) have teams of lawyers, and sneaky ways of detecting when people are downloading or sharing their content. I've heard from readers who have received letters demanding payment of royalties, or threats that their Internet service might be terminated. One high-profile case involved college student Joel Tenenbaum, who took his case to trial, was found guilty, and ordered to pay $675,000! He's been fighting legal battles since 2003, but none of his appeals have been successful. And there's also the problem of getting malware disguised as the music or other content you thought you were downloading. Hackers and othercyber-criminals have no compunction about taking advantage of people who are looking to get "something for nothing." The result could be a nasty virus infection, unwitting enslavement in a botnet, or even identity theft. To find the files they want to download, users turn to Bittorrent search engines. These sites do not host the desired files themselves; they serve only as indexes, providing the torrent files that contain the information necessary to locate and download the pieces of a desired file. Torrent search engines have been shut down for facilitating copyright infringement; Torrentspy.com and ISOHunt.com are two examples. By providing the information that illegal downloaders need to commit their crimes, these sites were deemed to be accomplices and co-conspirators in many copyright crimes. So to answer the original question, there's nothing illegal about Bittorent, per se. Just like a knife, it can be used to do both good and evil. But realistically, there aren't very many people using Bittorrent software for legal purposes. My advice is to avoid using Bittorrent, unless you're 100% certain that the content you're downloading is 100% legal. Most recent comments on "Is Bittorrent Downloading Illegal?" Due to pressure from RIAA and others your ISP may spy on you and detect Bittorent use. Sometimes they deem that sharing/seeding a bittorent is more egregious than just downloading it.They may take various sanctioning steps. Be aware that sharing is enabled by default on most bittorent clients. Many years I was sanctioned by my ISP for sharing a bittorent. They capped my upload speed to something like 75K. This destroyed my download speed speed because TCP does depend on acknowledge packets. They left me dangling for a couple of weeks and then turned off the cap AT THEIR CONVENIENCE. For this (and other reasons) the very day that an alternative ISP appeared in my area i switched. However, to this day I am very careful when I allow files to be shared via Bittorent. Thank you for the clarifications for the masses. Using BitTorrent networks is NOT illegal but downloading copyrighted (music/movies/programs) most definitely IS. I normally rely on BT networks when I have to download large 'legal' and "OpenSource" files. For example, the latest version of a Linux operating system (OS) distribution would be totally legal. When the America's Cup sailing events in the SF bay were going on in January 2014, I downloaded them (after the events) thru BitTorrents, so that I can enjoy them on my large screen TV, since they were not available on any network. I did this to be able view them on my own time, without being forced to watch them real-time on YouTube. This activity can be borderline illegal but it left me no other choice, due to unavailability. Similarly, I am a fan of Dakar race and it was not televised this year. I was forced to download them thru BT networks (over 7GB of 26 episodes) I am a subscriber to Netflix and Pay over $100 for DishNetwork (over 250 channels, including HBO/Showtime/Cinemax in HD) on a monthly basis. But due to poor quality of Netflix streaming capabilities, I sometimes elect to watch these same exact movies via download thru BT networks. This activity may also be considered of questionable legality according the MPAA but I think I am justified to do so although their profit bottomline becomes at risk. The MPAA and RIAA (aka Hooligan B*st*rds and their shenanigans) have been screaming for over 4 decades that artists are starving due to such illegal downloading and sharing of music/movies. I have a library of 'legal' music which includes over 2,000 LPs and over 3,000 CDs. These groups have attempted everything to prevent me from enjoying my own content in so many ways in the past 40 years that I can see why BT networks (and illegal downloads) have flourished in the past and will continue to do so. This is tantamount to a cops/robbers game, as long as these Hooligan B*st*rds continue their shenanigans while startving artist continue starving. Yet I am also a paid subscriber to Sirius satellite radio, which allows me to record and playback such commercial-free content. Why should this be legal? Intellectual Property issues and Copyright Infringement efforts will also continue to be with us as long as the money interest of profiteers are not properly aligned with the justified needs of consumers that are continually being gouged by them. Some of the blame also goes to those who make policies (aka patent and IP laws, etc.) that primarily cater to (or cave in to) large businesses rather than the justified needs of the consumers. Bob, another great article, of explanation! I don't know how you do it ... You take a complicated topic and simplify it, every time. I basically understood what Bittorrent was about, but, I now have clarity about this whole issue. Yes, I was a user of µTorrent, but that, was quite awhile ago. Why did I stop? Mainly, because my own broadband had increased, to where it was much faster than µTorrent. I really, started using the BitTorrent method, when I was on much lower DSL broadband width, like 1.5mpbs. It really helped with the Large File Downloads. As my broadband width increased, my need for µTorrent decreased. I was finding that I could download Large Files, very quickly, as you stated quicker than using a P2P download process. Finally, after about 4 to 5 years of usage, I completely deleted my µTorrent account and haven't looked back. I will admit ... I did use µTorrent for some illegal means. I am not proud of that fact, either ... But, I did. In the beginning ... I didn't really realize, that what I was doing was bad. When, I started to see all of the articles and news reports, I knew that it was only a matter of time, for me to stop doing P2P downloading. I mainly downloading computer programs. I never downloaded a movie or music. I wanted some computer programs, that I honestly could not afford, so, I basically stole them on µTorrent. Most of these programs were what is known as Warez or Cracker Warz, usually full of viruses, Worms or Trojan Horses. These programs were provided by the Cracker community. They would "share" amongst themselves, which eventually led to lots of viruses, Worms or Trojan Horses, in their downloads. I found that downloading "illegal" Microsoft Windows Version, seemed to be the most popular. I know why, too ... People are simply tired of paying high prices, for a software that should be handled as an upgrade, most times. I think, Windows 8 is one of the few, along with Windows XP, where there were really major changes made and they could be considered "new" software. I know, that is why I did it. Then, about 3 years ago ... I truly realized, the error of my ways. How dare I, steal others created computer programs. What if, I had worked hard to develop a good, solid computer program, was trying to make a little money on my development and someone kept downloading it, illegally???!!! Then, it hit me ... It doesn't matter, if, the computer program is by a BIG company or an individual ... Getting an illegal downloaded program is simply wrong, wrong and more wrong. When, I really got that "wrapped around my head", I stopped doing it. BitTorrent (BT for short) as I understand it, was actually developed inside the community of music traders - music fans who have been trading in live concert tapes by bands like the Grateful Dead since the early 1970's. The music that is traded is in most cases NOT copyrighted, and the trading is allowed by most of the bands and artists involved, as a matter of fact, many of the trading sites and networks stick to an ethical honor code of never selling any of the live recordings, and of immediately stopping the trade in certain recordings if the band involved requests they stop. I discovered Torrents in this way, by following the live recordings of a number of contemporary bands. In the music trading communities that use BT, many shows are only available for a limited time such as a few days or a week, and then the seed is shut down. You can also find vast libraries (like Archive.org) that contains lots of historical material whose copyrights have lapsed, or that are not copyright protected to begin with. So contrary to popular impressions, there is plenty of legal material out there for download on Torrents. Of course, there are always going to be those who "catch a ride" on the effectiveness of the Torrent downloads, and that's where all the other mostly copyrighted stuff comes in - the movies, TV shows, magazines, photos, documents, etc. that are available today on Torrent networks. I quit using bit torrent years ago, but I can advise you to take caution if looking for old music or film files on places like Pirate's Bay. These sites are loaded with malware and I found the only safe way to poke around such files was to use Linux, which cannot run an .exe file. Ubuntu Linux is your easiest route, for it comes with a torrent client, but seriously--be prudent about what you download--you really don't want to get hit with a lawsuit because you wanted a few episodes of some TV show you missed or a movie you were too cheap to purchase--it just isn't worth the risk. I don't download files, but did discover a couple of sites where I can watch old episodes of TV shows. Is a streaming site legal? Is it legal to watch movies on YouTube? EDITOR'S NOTE: Youtube monitors their site pretty aggressively, removing copyrighted content when found. One of the best uses of Bitorent is to download a ISO file of a Linux distribution. Also many clients will send out requests for Random Chunks of the file they are seeking rather than downloading in order. This tends to avoid the "everyone only has the start of the file" problem as the chance of a "hit" goes up. The Clients sometime even show this graphicaly as a line that gradually fills in one dot at a time. Finaly it is good Netiquete to leave your client running after the download for at least as long as the download took, so that you can do your part in sharing the file. Your IP address will be in the Bittorent cache of the sites you got bits of the file from so other users will be looking to your computer to get bits of the file. Is Bittorrent Downloading Illegal? As Bob says, depends on what you are downloading or sharing. There is a lot of legal content to download. Yes you need to be careful of what you are downloading to avoid malware. Some sites are more reputable than others. Bittorrent Downloading is a great capability that I frequently use legally. In regards to BT clients, I prefer Vuze. Easy to configure, easy to use. I'd add an emphatic second to J Schwab's comments. In my experience, the majority of film/video and software downloads do contain malware (and I'm not talking about the "hack-tools" for activating software). If you're in the habit of downloading torrent files, check your hosts file - it'll be an eye-opener; it's also a great way to unwittingly become part of a bot-net. I still love to download linux ISO's etc with Bittorrent as it seems much faster especially when servers are slow or overburdened. in one place. Your information has inspired great comments and confessions ha ha ha. As for me, I have neither the need or use for such downloads and trying to do this in Indonesia would be a joke. Loved the analogy using the 'knife' by the way. Reason so many people download illigal stuf is because of the high price you need to pay for it. If good working software was sold for just a few bucks then everybody would buy the programs to be able to work trouble free with them, And, the company who made the program would probably will make more profit too. Just think on it, If just 100 million people would buy Windows-8 for only 25 dollar howmuch money would be made. Or a good PC protection program for 5 dollar each, I guess almost everybody would start paying for it. If you like quality movies for home use then you need to wait untill they coming out on DVD or better disks. Explain me why a movie that is already 3 or more months old does cost on DVD so much more than when it was brandnew in the cinema? Making stuff afordable for everybody results in way less illigal downloads, and that means a way higer sales rate for the makers, and as result, they get most likely way, way more income of there products. I completely agree with everything that has been said about torrent sites in the article and the comments: most of the downloading is done by the millions of people worldwide, who want to get the latest movies and albums for free - ILLEGALLY! They think that by sitting at home downloading these movies and albums, no-one is going to know that they are in fact stealing them! However, I think that illegal downloading would be greatly reduced if they just brought the prices right down for DVD movies and music CD's. Because people on low incomes still want to watch/listen to them but cannot afford to buy them, which could account for the majority of illegal downloading that is done. Although, there are probably millions of people who download illegal copies and make further copies to sell at a tidy profit, which in my opinion is a much more serious crime. What I don't understand is why Governments can't just close all the torrent sites down? Because one would think that would be a whole lot easier than leaving ISP's to sanction individual users and companies filing law suits against illegal downloaders? Sheri said: What I don't understand is why Governments can't just close all the torrent sites down? This has already been tried - just like reel-to-reel tapes, cassettes, VHS, bland CDs/DVDs, and every other type of recording device/medium. There are just too many legitimate uses. It would be like banning cars so they wouldn't be used as getaway vehicles. The "cure" would be worse than the "disease." One thing she said, though, has been well documented in various studies - lower the price to increase sales and make pirating less attractive. As for those who think it's OK to download old movies and music, remember the Copyright has been upped to 75 years. So, unless what you are downloading was produced prior to 1940, it's illegal. Even though the publishers may no longer care, it's still pirating.